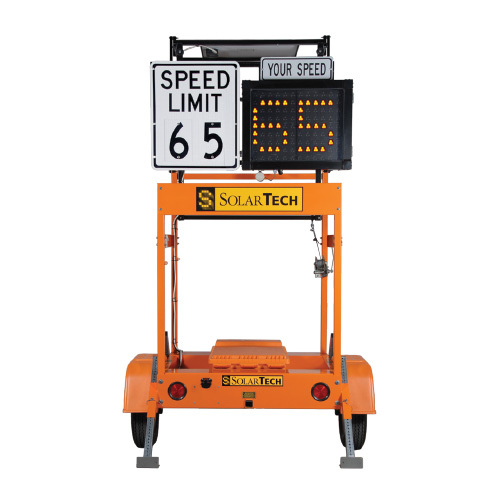 Create a safer work zone with a speed awareness trailer - let those driving through your work zone know how fast they're going and what the posted speed is. The Mega-Tech Touch Screen Control Console is a an easy-to-use, Water-proof, backlit, full colour display with intuitive icons for programming the display board . Program your own and control the time and date of the display using the real-time clock/calendar system. Display up to 3 digits and the ability to select from 4 font types with a character height of 18”. The Speed Limit sign is 30" x 36"and is mounted at 7'. Data Collection Built In - Records raw data on a USB “memory stick” for processing and analysis using statistical analysis software (sample screen above). Records three files: Raw Data, Statistical Data and Histogram Data. Data includes year, month, day, time, and speed readings including lowest, highest, mean, median, mode and standard deviation.